A research centre which houses thousands of birth, death and marriage certificates is closing due to a drop in visitor numbers. The General Register Office (GRO) said the Family Records Centre in Islington, north London, was no longer viable and would close early next year. Information will now be available online and microfiche of the records will be at the National Archive at Kew. Critics claim it will hinder the process of ordering certificate copies. 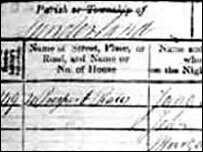 The Family Records Centre (FRC) in Myddelton Street provides information about the census as well as indexes to wills and probate records. But the GRO said steadily decreasing numbers were an indication people were accessing records by other means and that "providing a service in this form could no longer be justified". The GRO said much of what is available at the FRC could be accessed online as well as in public libraries, family history societies and some local authority record offices. It is also hoped an ongoing project to create an online index of 250 million births, deaths and marriages will significantly improve public access to the information. However Neil Fraser from probate research firm Fraser and Fraser said it was told by the GRO that the IT project was a year behind and there was "no provision for a public index". He said: "They are insistent that user numbers at the Family Records Centre has fallen dramatically but the actual ordering of... certificates has risen significantly." He predicted that as a result of the changes ordering a certificate could take up to five days instead of the current 24-hour wait.